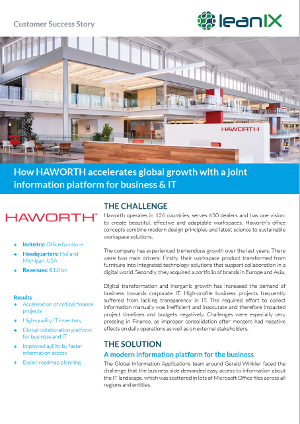 Haworth operates in 126 countries, serves 650 dealers, and has one vision: to create beautiful, effective and adaptable workspaces. The company has experienced tremendous growth over the last years. There were two main drivers: Their workspace product transformed from furniture into integrated technology solutions that support collaboration in a digital world. Secondly, they acquired a portfolio of brands in Europe and Asia. Digital transformation and inorganic growth has increased the demand of business towards corporate IT. High-profile business projects frequently suffered from lacking transparency in IT. The required effort to collect information manually was inefficient and inaccurate and therefore impacted project timelines and budgets negatively. Challenges were especially very pressing in Finance, as improper consolidation after mergers had negative effects on daily operations as well as on external stakeholders. Easier roadmap planning How did they manage this? Fill out the form to learn more about their solution to this problem using Enterprise Architecture.